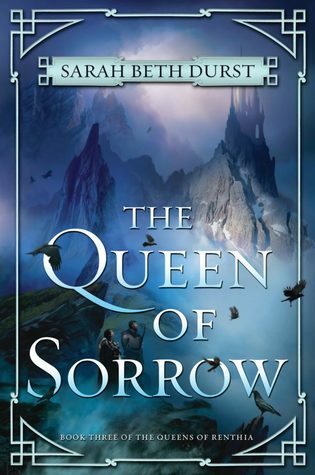 The Queen of Sorrow is the final book in Durst’s Queens of Renthia trilogy, which you should really read in order. If you’re not familiar with the books, they’re fantasy where humans struggle to survive in a world dominated by cruel and capricious nature spirits. The characters are adults for the most part, but the tone and content of the books are such that they have YA crossover appeal. The first book is The Queen of Blood, and the second is The Reluctant Queen. There are some inevitable spoilers for these first two books in the rest of my review. Since the end of The Reluctant Queen, Daleina and Naelin have been ruling Aratay together. It’s a wonderful solution… as long as the queens are operating with the same goals. When Naelin’s children are kidnapped by spirits likely belonging to Queen Merecot of Semo, Naelin is overcome with rage and grief. She’s willing to risk all of Aratay to get her children back, and only Daleina is holding the country together. Meanwhile, Merecot is still determined to rule over both Aratay and Semo, and the only possible path she sees is killing Daleina and Naelin. My favorite thing about The Queen of Sorrow was how it delved deeper into the world building. I think any sequel should expand upon the world in interesting ways, and The Queen of Sorrow delivers. We go deeper into the mythology, discovering that the spirits have their own creation myth, and we learn more about the dangerous and mysterious untamed lands. In addition, we get brief glimpses of the other kingdoms and queens and a more lengthy look at Semo. While the previous books may have featured brief glimpses into Merecot’s POV, The Queen of Sorrow places her perspective center stage, and it’s fascinating. The old adage that a villain is the heroine of her own story rings true. Merecot believes that she’s in the right, that she’s the only one who can save both Semo and the entire world. And here’s the thing: she might not be totally wrong. Merecot is one of the most morally complex characters in the entire series, so its no surprise that she quickly became my favorite as soon as I got her side of the story. Thematically, The Queen of Sorrow is dealing with the topic of motherhood. Obviously, there’s Naelin, who values her children above all else and will stop at nothing to protect them. But there’s also Daleina, who sees all of Aratay as her children, and Garnah, who I’d classify as chaotic evil (Dungeons and Dragons term) but who still professes to be seeking a relationship with her son. Although I don’t have the space here, the contrasts and parallels between the three may be worth exploring at a later date. Why is my rating of The Queen of Sorrow lower than it was for the previous two books? For one, I’m conflicted about the ending. I obviously can’t speak too much on this topic, but if you read the book, I think you’ll be able to guess at what I’m talking about. Additionally, I started to feel that there were just too many characters in The Queen of Sorrow and that the narrative was getting muddled. Do all these people really need POV sections? That said, I was happy that there was a f/f relationship between two of the supporting characters, as this series was so far almost painfully straight. I’ve heard that Durst is planning a stand alone novel set else where in this world, and I’d be more than willing to read it! There’s still plenty more to be explored with this setting, and I can’t wait to find out what Durst has in mind.